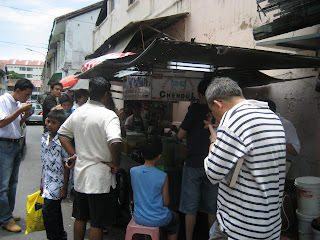 J and I got Jalan Penang (road) for a fix of something icy, this time it is cendol. 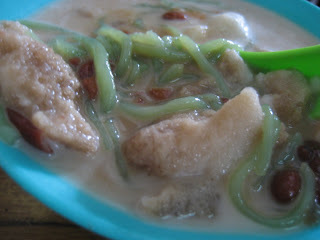 But it is not like the ordinary cendol we can get others places as this one apparently is Teochew style. We ordered for a bowl and got into the restaurant, where this stall is parked right outside. This restaurant, charged extra rm0.40 if you ordered the cendol into their premise. I guess they can’t earn much judging that everyone drinks from the stall outside instead of their drinks. We obliged nonetheless as we wanted a place to sit and cool down. The cendol came, looking ordinary, but once I tasted it, I found that it is milder in coconut taste than the usual Indian cendol and also there are more red beans. I can’t say this is the best cendol, in fact I still love the one back in PJ, still it is a cool refreshing drink to down the thirst. 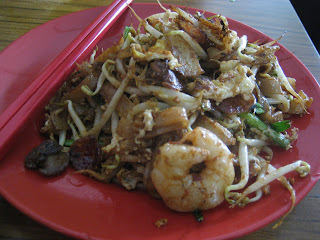 Then J spied on a char kuey teow stall in restaurant and wanted to give it a try. After all we could not have the famous one at Lorong Macalister. The plate of char kuey teow came, Penang style with huge prawns, cockles, lap cheong (Chinese sausage), fishcake, and taugeh (beansprouts). It tasted great, even better than the one we had at Kek Lok Si. So J quickly cleans out the plate. After that, I still yearns for more icy stuff and told J about a famous ais kacang (local shaved ice dessert) nearby at the next street. 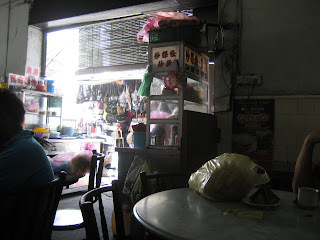 Just outside the restaurant, is the junction to four famous streets in Penang. 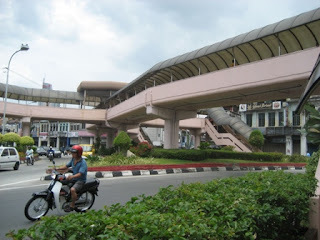 We walk over the overhead bridge, which connect all four streets, one of it leading towards Komtar (shopping mall), towards our destination. 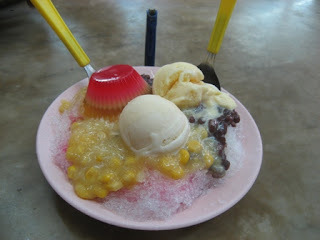 Down the street from the overhead bridge, we got into Kek Seng restaurant for its famous ais kacang. We ordered for one and it came looking really special. It tasted great too, unlike anywhere else I get, with sweet corn, red beans, huge jelly and two dollops of ice cream. The ice cream is even freshly made, as I saw a huge sign showing they have their own-made famous durian ice cream here, which was served with the ais kacang. Indeed the ice cream tasted great and complimented the ais kacang well. Feeling bit nibbly, we ordered the popiah (Chinese spring roll) to go along. 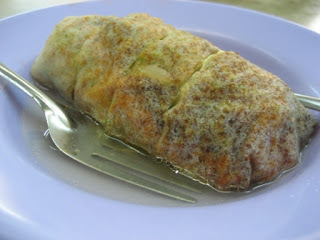 The lady came to serve asked us whether we want to pour in the broth (first time I encountered broth for popiah) then we agreed and it was poured over the popiah. It was a little bland but the texture was not bad. Feeling really filled up we decided to have a little break from our eating frenzy and head over for some massage and reflexology. 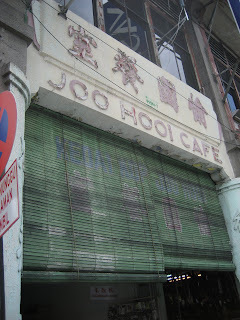 It is located at the same row with Joo Hooi Café, at the other end of the row of shops. 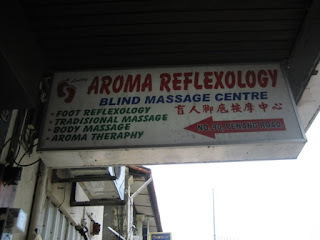 Here, they offer massages and reflexology by the blinds. Nowadays, it is really popular in Malaysia, for the blinds to learn reflexology, from a school which is catered to them specially. Going to these places always makes me feel that I had helped them in a way, where they can earn their own income. I opt for the reflexology while J went for the massage. The service was great and both of us enjoyed it. I would recommend you to stop by if you ever had a chance to be around town. After an hour and half of relaxing, we are ready to eat again (surprise!). So J and I got in the car and sped off in search of Char Kuey Kak (stir fried radish cake) and Or Chien (oyster omelette). I read that the one near the Chinese school was famous so we went there and alas again, we found that the stall was not open. Then we guessed that it is only opened for dinner. So we sat down and ordered har mee (prawn noodle) instead. 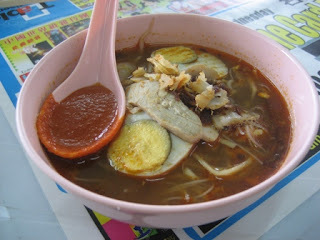 The noodle was great, expectedly as har mee is another famous dish hailed from Penang itself. It came in a superbly rich prawn broth, with prawns, sliced pork, eggs and beansprouts. It was good; we eat and drank the soup dry (we would not want to count the calories here). So, feeling satiated again, J and I decided to head on to some site seeing. I just found out, thanks to J that, besides the glorious food, it turns out there are some hidden places to visit in Penang.